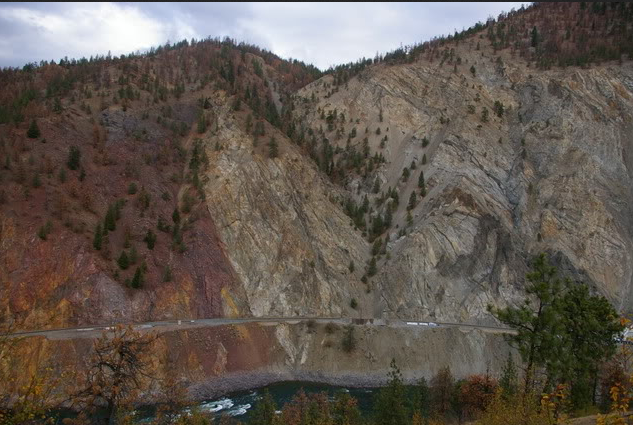 These cliffs are situated across the Thompson River from Hwy 1 just north east of Lytton BC. They are located in the Skihist Ecological Reserve which is not accessible by car and you MAY NOT enter the reserve without a permit. The cache location gives you a view of the cliffs across the Thompson River where you will be able to park safely and take some photographs. For safety purposes, this cache is available to traffic heading towards Lytton. For better viewing you may want to visit the Behold! Marble Canyon. This is a tricky spot to stop at if you are driving in an RV, so use the above coordinates to safely stop and take the photo. You may also be able see a portion of the cliff from the Skihist Provincial Parkday use area. The cliffs are located in the physiogeological region called the Intermontane Belt in BC. 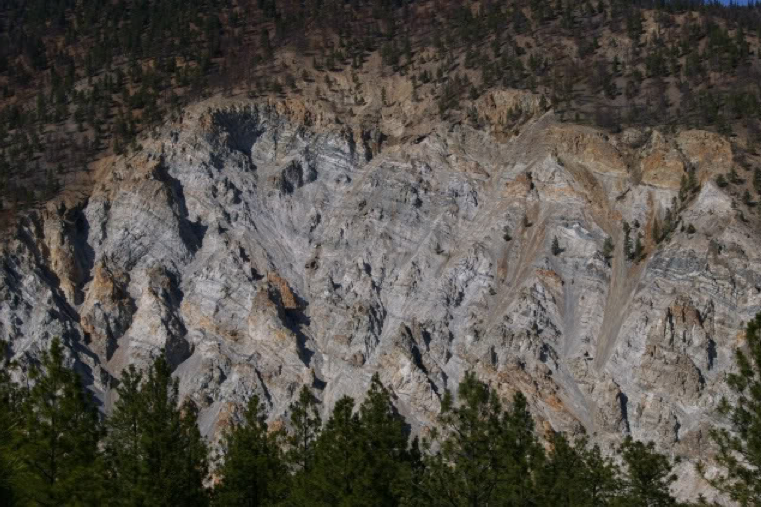 Geologists estimate that the rocks are 225 million years old, and are found in the Mount Lytton complex of BC. The cliffs are composed of gneiss. Gniess is a metamorphic rock that is formed when existing rock is exposed to high pressure and temperatures (for instance by being buried deeply under younger rocks, or during tectonic processes) which alters its composition and usually results in a harder more compact rock. The Skihist cliffs are a spectacular example of banded gneiss. The light coloured bands of rock are mostly quartz and feldspar, and the thin dark bands are composed of amphibolite. The pressure can also result in the layers being contorted into wavy folds. 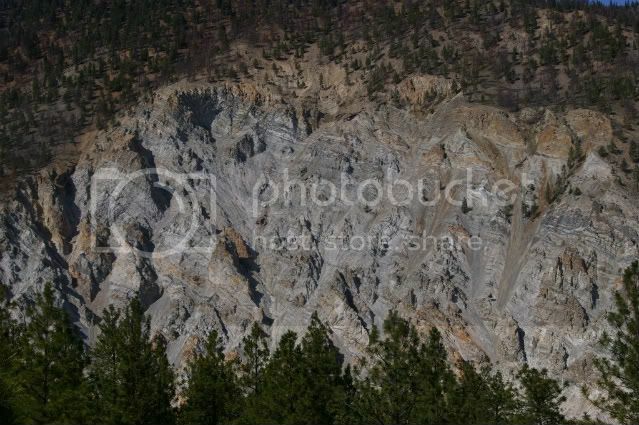 This is called compositional banding and there are visible examples of this on the cliffs. 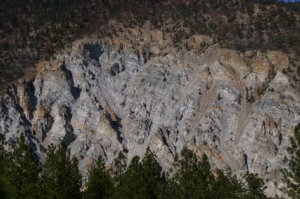 “Because of the kinds of minerals and degree of alteration present, geologists estimate the rocks of the Mount Lytton complex were likely metamorphosed at a depth of 15 km below the surface. These rocks were then brought back to the surface through the processes of uplift and erosion. View of the cliffs from the Earthcache location in the spring time. Some beautiful photographs of the cliffs are in the book Manufactured Landscapes: The Photographs of Edward Burtynsky.